Update 2/17/10: Event postponed to early March. More as soon as I find out. 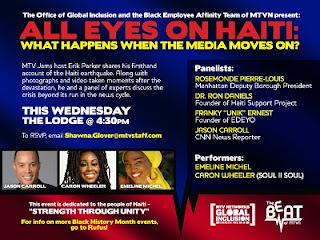 Thought I'd let you know that I have been invited to be the guest blogger for this event taking place next Wednesday organized by the Black Employee Affinity Team of MTV Networks for Black History Month. It is not clear yet if the event will be streamed live or edited for later repost. I will keep you posted as I find out. I will be tweeting the event live at http://twitter.com/kiskeacity. Please let me know any questions you may have for the panel. The topic is one I am very concerned about: What Happens when the Media Moves On? That is at the heart of the preoccupation of many in the citizen media world, the good folks at Global Voices included. Panelists will be Rosemonde Pierre-Louis (Manhattan Deputy Borough President), Ron Daniels (Haiti Support Project), Franky Ernest (Founder of EDEYO), Jason Carroll (CNN Reporter). Emeline Michel will be performing. Click on the flyer to see details.